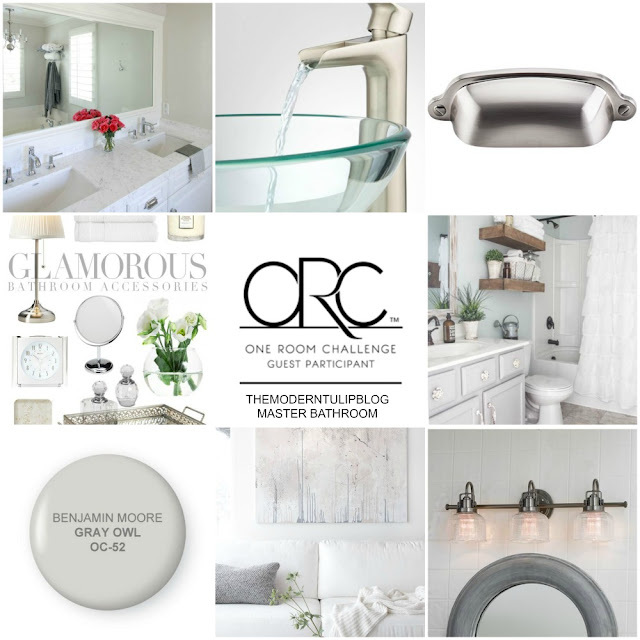 13 comments on "One Room Challenge || Master Bathroom || Before Pictures & Moodboard"
So exciting! I love your vision for it, good luck! Our bathroom is nothing to write home about, but since we're renting there's nothing we can do about it hah. We just bought our first house in November, so I'm all about the home renovations since then =) Honestly, I think you'll be surprised at how much difference a coat of paint and new fixtures make in this space! At least all of your tile and trim are white to start; that's progress! I will caution you against glass vessel sinks. I know of three families that installed them (all from different stores) and they each had different problems: leaks, cracking bowls, etc. Honestly the vanity you have pictured in the top left of your inspiration board gives me major heart eyes. I'd go in that direction! Your bathtub is divine! I can't wait to see what you do with this space! I Love all your inspiration!! It's going to look so awesome when you're done! Good luck. You should consider doing a sliding "barn" door for your closet. You would have to lose your towel hooks but I think it could look really great! This space is going to look gorgeous when you're finished! Do you have enough room on that wall to install a pocket door for your closet? That's what we have in our bathroom (we actually have a very similar setup), and it works like a charm. Yes, I could see how an update will make this room looks awesome!I thought your comment about your husband was kind of funny about starting projects and then not completing them! Hello? I may have someone like that, too...LOL! But it's all good - hey at least he's on board with you about it financially! !